Location: Shizuoka City, Shizuoka Pref. 12 houses, 2 storehouses, 30 rice paddies, 370 meters of waterways. 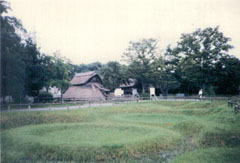 The Toro Ruins in Shizuoka Prefecture mark where a village used to exist around AD100 to AD 300. In the conventional history of Japan, this period is classified as the latter half of the Yayoi Period, the first age of agricultural culture based on rice cultivation. The Toro Ruins are one of the most important sites explaining the agricultural culture of this particular period. The large-scale ruins consist of dwelling areas, rice paddies, and forests and are thought to have been buried by a river flood caused by a typhoon. As a result of careful excavation and research for four years starting in 1947, ruins of rice paddies in the Yayoi Period were discovered for the first time. Remnants of Japanese cedar woods neighboring the village, 12 houses, and two storehouses with elevated floors were also found, and farming tools such as wooden hoes, spades, spatulas, and stone knives, building materials, weaving machines, musical instruments, and pieces of earthenware were excavated almost intact. Many of the unearthed articles convey the affluence of life and culture at that time, such as fishing gear, ornaments, a variety of grain and fruit seeds, and bones of birds and beasts. Excavation work of the Toro Ruins was exceptionally large-scale and systematic, considering that the work was being carried out during the rebuilding of devastated Japan after the Second World War. 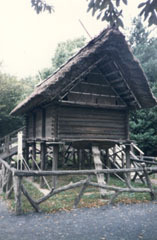 The research was of such academic significance that it led to the establishment of the Japanese Archaeological Association. The Toro Ruins were designated as a national Special Historic Site in 1953. The houses and storehouses have been restored to their original state, and the site is open to the public as a historic park. Photos: (Top) Toro Historical Park; (middle) a restored storehouse with elevated floor. (Shizuoka Prefecture).